City’s HCID Open Day, which brings together guest speakers from industry and academia to address issues related to user design, user experience and related fields, is themed Bootstrap UX. On 27th April 2017, City, University of London’s Centre for Human Computer Interaction Design (HCID) will be hosting its annual HCID Open Day. City’s HCID Centre is one of London's largest human-computer interaction related research groups, carrying out research into user testing, usability and accessibility evaluation, user research and user centred design. 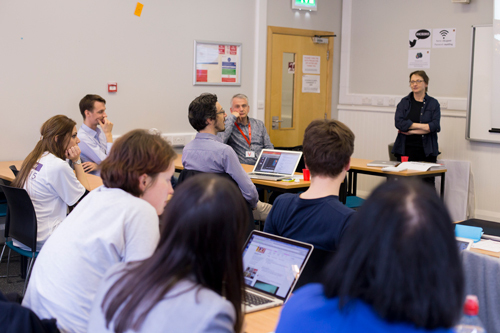 The Open Day is a yearly event in which guest speakers from industry and academia are invited to address issues related to user design, user experience and related fields. This year’s Open Day theme is Bootstrap UX. It will explore the ways in which people can achieve user experience (UX) outcomes on a budget, without having a large team or expensive kit. The theme also ties into the launch of City’s free UX consultancy services for start-ups and SMEs through StartUX. This year, confirmed speakers so far will be drawn from Akendi, Foolproof, School of UX, GDS and other organisations. Co-director of the HCID Centre, Senior Lecturer, Dr Simone Stumpf, will deliver a timely talk titled, ‘Do you trust your smart heating system?’. She will be describing the research around the FREEDOM project, led by PassivSystems Ltd and funded by Western Power Distribution and Wales & West Utilities. Dr Stumpf’s presentation will give an overview of the current state of the art in HCI relating to smart heating systems and present the results of a study to investigate user controls and user interface explanations. For more details on speakers and talks, please check out the 2017 HCID Open Day website. Information Architecture is about designing the structures of digital information environments, such as Websites, intranets and mobile apps so that people can easily find their way around them, and find the information they need.